I thought I would take a few moments to point out some interesting points on Damon. It looks at this point — and has for a while — that Damon will not be back in 2010. Boras has set his asking price a little to high for the Yankees. But here are a few reasons that I think you shouldn’t count out Damon returning to the Yankees. Ken Davidoff of Newsday tweeted a couple of weeks ago, that Damon requested a two-year, $22M deal from the Yankees, which they declined. This was after Boras said that they wouldn’t take anything less than a three-year deal. The fact that Damon was willing to bring it down to two shows that he really wants to play for the Yankees. No other teams have shown interest in Damon, yet. One possible suitor a couple of weeks ago was the Giants, who signed Mark DeRosa to play left. Another possible suitor was the Braves who got Melky in the trade for Vazquez. All of the teams that showed any interest at all were from the National League. It’s very unlikey that a NL team will take him because there is no DH, and I doubt they will risk having Damon as their everyday left fielder. So don’t count it out. It’s quite obvious that Damon really, really wants to play for the Yankees. They also may end up being the only choice for him. The only thing between Damon and the Yankees is Boras. If Boras backed down, Damon would be on the Yankees. There are only two ways Damon ends up on the Yankees: (a) Damon goes to the Yankees, alone, and works out a deal, or (b) Boras realizes that the Yankees are their only choice and takes a cheaper deal. But don’t expect (b) to happen until, very, very late. The Buzz: Melky/Gardner to the Cubs? I was surprised to see a report in the Daily News today that the Cubs might make a move to send Melky Cabrera or Brett Gardner to Chicago in exchange for a pitcher. According to FoxSports.com, the move would be initiated by the Cubs GM. With the recent loss of the Cubs OF Milton Bradley and the Yankees shortage of pitchers, coupled with the fact that the Yankees have extra outfielders and the Cubs have extra pitching, the deal would make sense. As the Yankee outfield looks right now, its Granderson in center, Swisher in right and Melky in left. Gardner and recent Rule 5 draft pick-up, Jamie Hoffman, would be the fourth and fifth outfielders respectively. Carlos Zambrano, Ted Lily, Ryan Dempster and Randy Wells are the Cubs top pitchers. Zambrano is a head case that I don’t need to watch everyday, freaking out in the clubhouse. Dempster had a great year in 2008, but is iffy otherwise. Lily is a solid, veteran starter. Wells is an extremely young starter who seems to have a lot of potential. So, in the rumor stages of this deal, you can pick which pitcher you would like to see. Either way, the Yankees need pitching. As it looks right now, these options on the Cubs look a lot better than what’s left on the market. Neither Gardner or Cabrera is going to be a huge difference maker, but will the Yankees be willing to give one of them up? UPDATE 8:58 p.m. Ken Davidoff of Newsday tweets that the Yankees talked to the Cubs about a trade for Zambrano. No talks are active as of now. Jon Heyman of Sports Illustrated also tweets that if this trade were to happen, the Yankees could go after Jermaine Dye to fill in for Melky/Gardner. Hes the one we have all heard about. The most prized possession of the 2009-2010 off season. After a shaky ending in his time in St. Louis, Holliday is up in the air and ready to sign a big long term deal. He led the league in hits, batting average, RBI’s, and doubles in 2007. He will only be 30 years old at the beginning of next season. He is consistent, hitting over .300 in his past five seasons. The Yankees need an outfielder with the absence of Damon and/or Matsui. He wants to play on the east coast. He has experience in the postseason, including the world series. He is a type A free agent and the Yankees will need to give up high draft picks again. He won’t be cheap and will demand a long term contract. Chat. This is the guy the Yankees need. This is the guy that can make the difference. 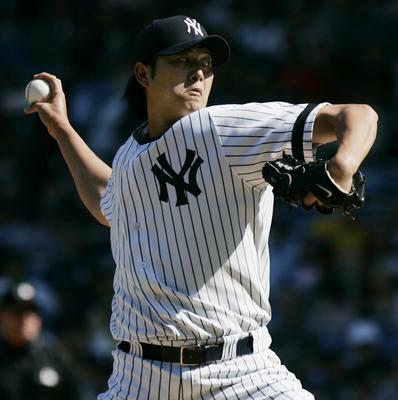 Lets face it, Damon and Matsui will not be on the Yankees together next year, and the Yankees need to fill that hole. Holliday will make this team younger, and can be part of a core that will become a dynasty. The combination of Holliday, Teixeira, A-Rod, Sabathia, Chamberlain, Hughes, Cano, Burnett, and Cabrera looks nice for the next five years. The Yankees have made it clear that there first priority is a starting pitcher. Having said that, the Yankees will go aggresivley after someone to fill that spot and will then come aggressively after Holliday later in the off season, with a big, long term deal. The Yankees are reportedly targeting Tigers center fielder Curtis Granderson (NY Post). Granderson has a contract through 2012 with an option for 2013. The Tigers will surely be hesitant to trade Granderson, but in a city that has been hit hard by the economic downturn, it may not be up to the executives. The Tigers still have players with big contacts such as Guillen, Ordoñez, Willis and others. Graderson would be a big upgrade from the Yankees current center fielders in Gardner and Cabrera. Both were thought to have huge potential, but neither put up all-star numbers in 2009. Granderson would likely come to New York as a part of a package that includes Yankees top prospect Austin Jackson. 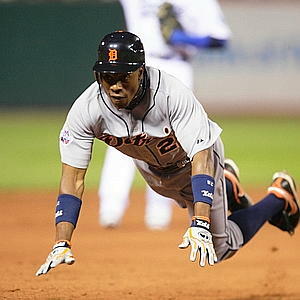 Granderson’s stats all fell from the 2008 season to the 2009 season. 29 The age that Granderson will be at the beginning of next season. 30 The amount of home runs Curtis hit last year. It was a career high for him. It was fourth in the league for all AL lefties. 141 The amount of times Granderson struck out in 2009. That was the 9th most in the Majors. Here they are, as voted on by you, the fans, your 2009 YANKEES SEASON AWARDS!!! One of Jeters best years of his career came this year. Highlighted, of course, by his record breaking hit, passing him by Lou Gehrig on the all-time Yankees hits list. Derek is a sure candidate for the AL MVP with 212 hits (2nd in the AL), a .334 batting average (3rd in the AL) and a stellar year at short stop. Congratulations Derek Jeter on your 2009 season award! After signing a record breaking contract with the Yankees in the 2008 off season, Sabathia has stepped up big for this franchise. Sabathia’s 19 wins rank 1st in the Majors, his 3.37 ERA ranks 4th in the Majors and his 1.15 WHIP ranks 4th in the AL. 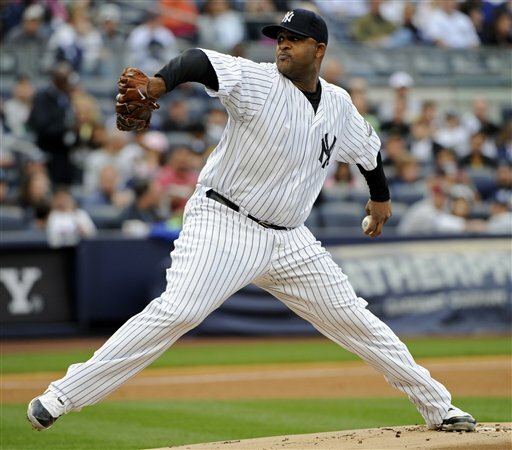 Sabathia is an overwhelming candidate for the 2009 AL Cy Young award. Congratulations C.C. Sabathia on your 2009 season award! Possibly one of the best games of 2009 in all of the Major Leagues. A 0-0 game going into the 15th inning against the Red Sox ended with a 2-run, walk off home run by Alex Rodriguez. Of the 15 walk off of the season, this one, I think we can all agree, was the sweetest. The Yankees went on to sweep the Red Sox in that four game set. Congratulations Alex Rodriguez on your 2009 season award! As a part of a sweep in the Yankees first trip to Citi Field, A.J. contributed by throwing a 7.0 inning, one hit shut out, while striking out 10 Mets. Congratulations A.J. Burnett on your 2009 season award! last year to a .320 batting average, 204 hits and 25 home runs this year. His hits rank 3rd in the AL league. 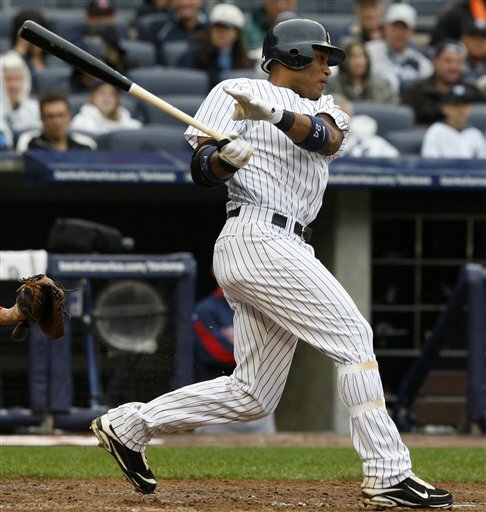 Congratulations Robinson Cano on your 2009 season award! One of the big three in the offseason signings contributed hugely at the plate, but also hugely at first base. His .997 fielding percentage ranks 2nd in the AL. He has made just 4 errors all season. Great plays day in and day out have massively helped this team win 103 games. 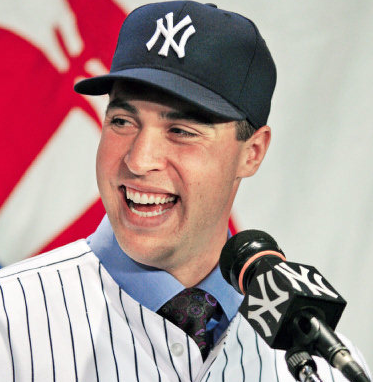 Congratulations Mark Teixeira on your 2009 season award! 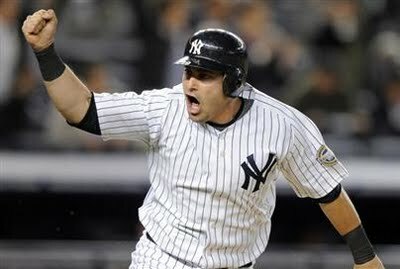 Making his Yankee debut on July 6th, Hinske has hit .226 for the Yankees with 7 home runs in 39 games. In his first 7 games with the Yankees, Hinkse hit 5 home runs. Hinske offers the Yankees some great, valuable options moving into the post season. Congratulations Eric Hinske on your 2009 season award! When Posada went down, the Yankees didn’t have much options. Cervelli came up to take his place, and the expectations were not that high. A .180 hitter in AA hit .298 for the Yankees this year. His first career home run in Atlanta arguably turned the Yankee season around. Congratulations Francisco Cervelli on your 2009 season Award! The Yankees were involved in the three biggest deals in the 2008 off season. The biggest was Mark Teixeira. A stellar glove at first won him an award earlier. His offense has him in contention for AL MVP. He leads the league in home runs with 39 and leads the league in RBI’s with 116. Without Teixeira, this team is much different. 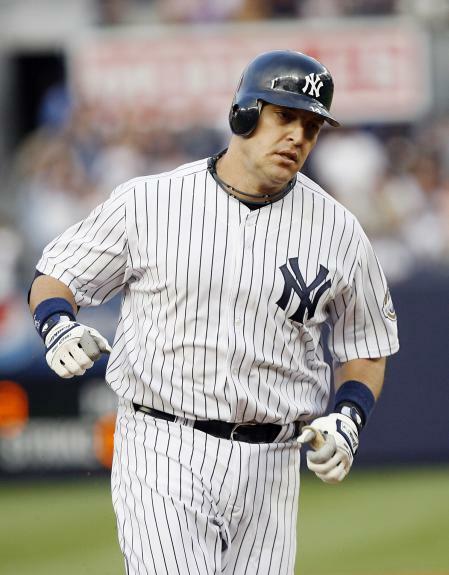 Congratulations Mark Teixeira on your second 2009 season award! IP over 2. Perhaps it was his foot injury last year in Houston, but with Wang’s production this year, it’s amazing the Yankees were able to do what they have done. You won an award… but no congratulations. Thank you to all of my readers and voters. The regular season coverage is officially over. Time for the playoffs! A.J. Powers Yanks past Halos for first time since ’04. No it’s not a typo, the Yankees did actually won a game in Anaheim. A.J. 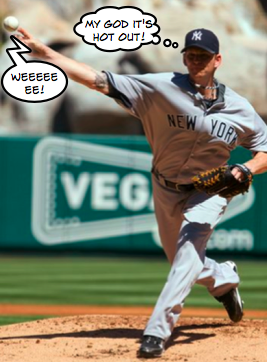 Burnett got the start for the Yankees today. I don’t think anyone knew exactly what to expect, including myself, but the result was more than any of us could have asked for. He went 5.2 innings giving up two runs on seven hits while striking out 11 and walking three. He was dominant and it’s a shame that he wasn’t able to go six. If he can keep this up — he’s done very well in his last two starts — then it would be a HUGE lift for the Yankees in the playoffs. The opposing pitcher was Scott Kazmir. He came in with an ERA under 2.5 against the Yankees as a Ray, and made his first start against the Yankees as an Angel today. He was pretty good to say the least. He pitched six innings of three run ball, walking three and striking out four. The Yankees really only got to him the fourth when they scored three. After a Hairston strike out, five straight Yankees reached base, highlighted by a Cano two-run single and a Cabrera RBI double. The Angels scored their two runs in the fifth and sixth. In the fifth, they had second and third and no one out and scored just one on an Abreu RBI ground out. In the sixth, they scored on a Matthews RBI double. Ian Kennedy made a return out of the ‘pen. I don’t think I was the only one thinking “oh no” when he came in. He pitched ok. He pitched a scoreless inning, loading the bases on two walks and a hit batter, but ultimately escaped unharmed. 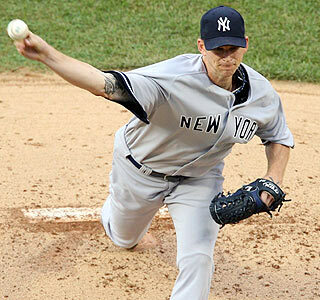 Rivera came in in the ninth to nail down a Yankees 3-2 win. It’s about time! This is the first Yankee series win in Anaheim since May 2004. Wow! I said that the Yankees needed to just win one this series and they win two. I said it would be okay if the Red Sox swept, they have lost two. Things have worked out in the last couple of days, bringing the Yankee Magic Number down to five. We’re almost there. It’s starting to look like the Yankees will clinch against Boston. Oh sweet karma! The immortal Red Sox come into town for a three game set. It’ll be Lester vs Chamberlain in the first game. Oh god. I would like to congratulate the Yankees on making it to the playoffs once again. They follow up not making the playoffs with the best record in baseball. New York doesn’t accept failure and this Yankee team has proved that for 106 years. Congrats on a great season! Keep your focus and win the division, that’s the objective here. Clinching just the playoffs isn’t too big a deal, but it’s certainly worth mentioning.